The Hospital Consumer Assessment of Healthcare Providers and Systems (HCAHPS, pronounced “H-Caps”) survey acts as a measure of patient satisfaction and is the foundation of Medicare’s value-based purchasing program which shifts reimbursement toward high-quality of care over high quantity of care. Key topic areas within the HCAHPS survey include the responsiveness of staff, nurse and physician communications, pain management, hospital cleanliness and noise levels, and care / discharge information. Research has shown that the top ways to improve HCAHPS scores include improving communication with patients (on diagnosis, medication, discharge), improving responsiveness to patient needs / questions / concerns and actively engaging the entire care team on improving the care experience. Communication is a great place to improve HCAHPS scores. Patients are not likely to praise your choice in medication, but they will praise how well you listened, explained or responded to their needs. The changes can be small, such as sitting while talking with patients or using smartphones to educate patients about their diagnosis or treatment, or they could be large, such as implementing technologies to free up more time for direct care activities. Free up more direct care time - By reducing two-way trips to nurse workstations, automating routine tasks, simplifying documentation and streamlining communication, nurses and clinicians alike have more time for direct patient care. Increase the speed of coordination with the care team - Faster & more accurate communication among the care team ultimately leads to shorter hospital stays and increased patient satisfaction. 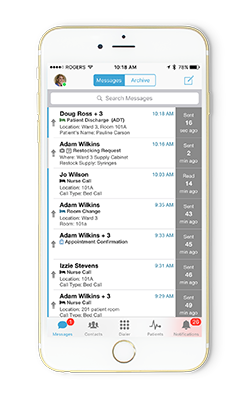 Improve responsiveness to alarms & patient requests - Nurses can remotely call back patients, route requests to non-clinical staff or assess the urgency of a call. Improve patient hand-off and discharge - Communication breakdowns during transitions often cause unnecessary delays and are a source of errors affecting patient care. Automating processes and communication hand-offs improves the patient experience. Faster test results - Integration points ensure that critical lab results are pushed directly to the care team and that medication and care orders appear instantly, without a need to log into systems to manually check for updates. Automate non-critical tasks - Automating coordination activities required to support patient care with RFID-triggered messages to maintenance or hospital facilities streamlines nurse workflow. Reduced unit noise - By integrating nurse call and alarms into our Hub, we dramatically decrease unit noise while also improving alarm responsiveness. Speed up maintenance cycles - With immediate and detailed messages populated by a tap of an RFID tag, hospitals can increase the response time of support staff (housekeeping, facilities management) to maintain hospital cleanliness. Simplify patient family communication - The patient-nurse relationship often extends to families, with patient satisfaction and well-being tied to effective family communication. Calls from families can be routed to the care team and call-backs can be made directly from a smartphone without compromising privacy. Reduce wait times - More efficient communication, workflows and push results all help speed up patient care and decrease the time a patient needs to be in hospital. Rather than “rushing patients through,” these improvements eliminate unnecessary patient wait times and inefficiencies in care delivery. Telmediq’s Communications Hub integrates and streamlines disparate healthcare systems into a single platform, improving patient care coordination, clinician workflows and care delivery. Seamless integration boosts direct patient care time and translates to lower costs and can positively impact HCAHPS scores. Contact us to schedule a demo today.